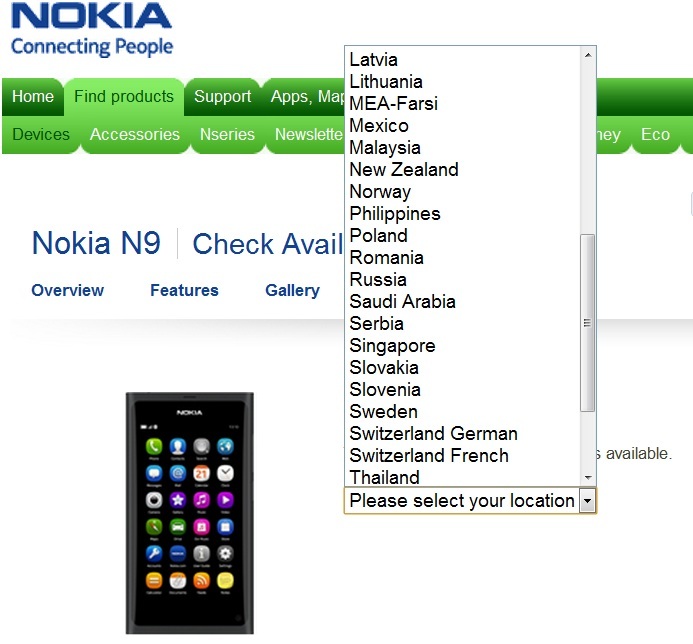 More countries for N9 availability. Nokia N9 Official Availability list updated. We received a tip from reader, Blue that the official Nokia N9 availability list have been updated. This doesn’t seem to still be the most up to date. South Africa for instance is an official country for N9 but it’s still not on that list. UK, France, Germany are still consistently not on any list. You may still be able to get your N9 via 3rd party retailers. However, some countries where we noticed their own official local N9 sites (Philippines, Indonesia, Argentina, Czech Republic, Mexico, Thailand, Norway, Brazil and Turkey). Bangladesh and MEA are also new, as well as Chile, Caribbean, Columbia, Estonia, Slovakia and Latvia. Hong Kong, Serbia and Greece are no longer on the list. Denmark (via Telia) Launched, available.